Scheduling: Without hectic school schedules, the lazy days of summer are an ideal time to make orthodontist appointments. Getting braces for your child usually takes at least three appointments including a consultation, the installation, and a follow-up visit. Booking all three appointments before the school year starts can have your child’s smile on its way to straight before Autumn arrives. Comfort: Braces can be a little uncomfortable initially, and often require some getting used to. Getting over the discomfort will be easier for your child if they can relax at home rather than dealing with an aching mouth at school. Cleaning: Your child will not only have to get used to eating with braces on, but they also must learn to clean them. This also will be easier to adjust to during summer break. You may want to get them an interdental brush and a soft toothbrush with slim bristles, which can squeeze into the spaces between teeth and around braces more easily. Time to adjust to mouth guard for sports: As you probably know, mouth guards are essential for keeping your braces protected during physical play or sports. While some sports like football require participants to wear a mouth guard, others like basketball make mouth guards optional. It is a good idea to get a mouth guard during the summer before sports start so any adjustments can be made prior to the season beginning. Don’t put off braces any longer! 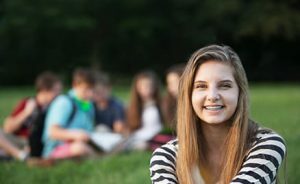 If you or your child are needing braces or Invisalign give Dental365 a call today at 212-799-7700 and mention this blog post for a free orthodontic consultation! Offer expires 6/30/16.